Stop the press… I have found the perfect shoe. 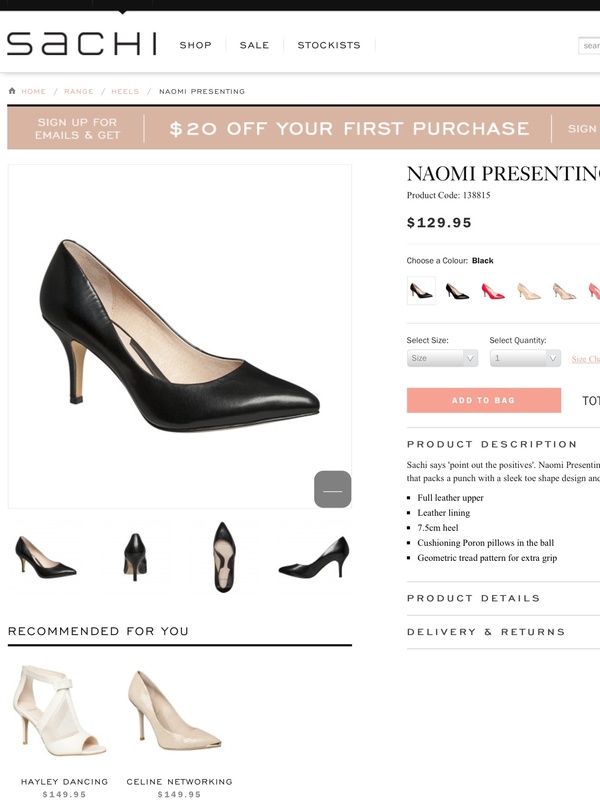 Sachi’s Naomi Presenting changed my perception of a day in heels. Some woman can walk..run in heels without a second thought. I am no such woman. My work often requires a lot of pavement pounding; distraction by sore foot is not an option. Experience warned me that by midday, after a morning in heels, I would be reaching for my flats. I was so pleasantly surprised to find that Naomi and I could spend hours together racing from store to store without as much as a rub let alone the crippling pressure on the ball of my foot. The picture doesn’t do her any justice. While the heel only measures a humble 7.5cm Naomi still looks hot paired with some skinny jeans . She has the sexiness of her stiletto sisters without the pain.